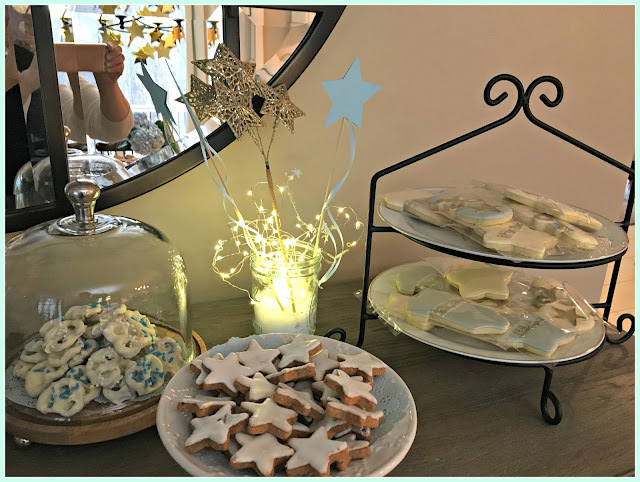 I had the privilege of hosting a baby shower this past weekend for my daughter who is expecting our first grandchild in January. I picked Twinkle, Twinkle Little Star as the theme. Here I used Buffalo snow as "clouds" and little battery-operated twinkle lights as "stars" above the cute little onesies. Yes, he is a boy! 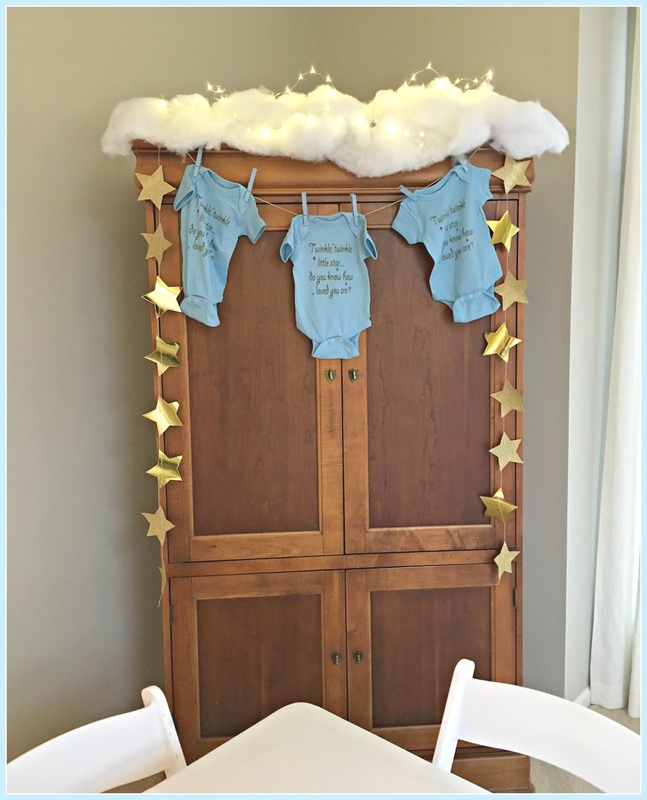 I hung gold stars from the curtain rods around the living and dining rooms as well. 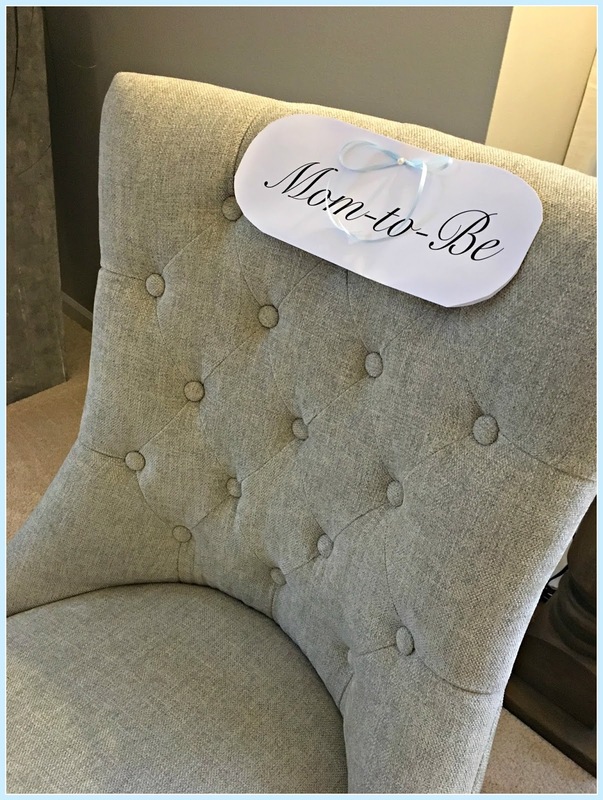 The mom-to-be's chair was reserved right next to the present table. 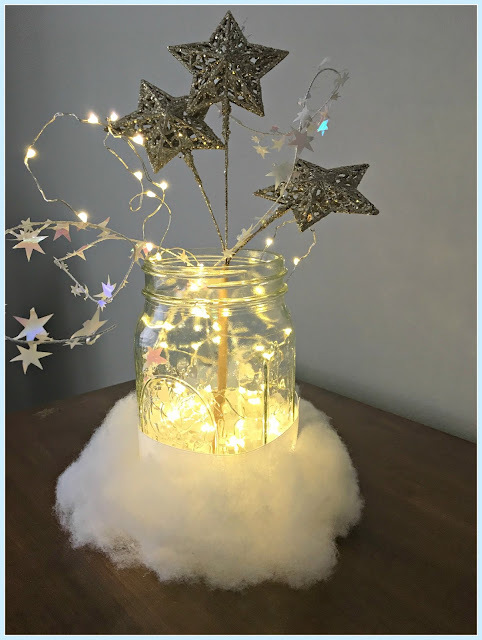 I made these little centerpieces with more Buffalo snow, twinkle lights, a star pick, and some star garland. I also added a couple blue stars with blue ribbon streamers hot-glued onto shish kabob skewers (not shown in this pic). I was actually thankful for a cloudy day. The twinkle lights had a chance to really sparkle! I had the shower catered, the first time I've done this. Let me tell you, it was a wonderful experience! I was able to relax and enjoy the shower so much more than if I had been serving and refilling coffee pots, etc. The shower was at 11 a.m. on Saturday, so I served brunch. 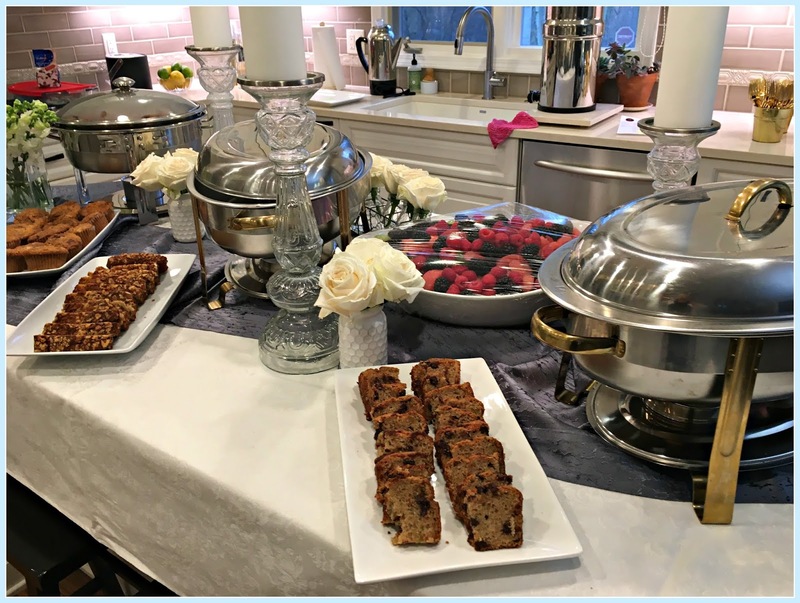 We had layered omelet, with zucchini and dried tomato, sour cream and chive potatoes, apple-flavored bacon and sausage skewers, fruit salad, and several types of breads, muffins, and scones. Oh, and salmon quesadillas. 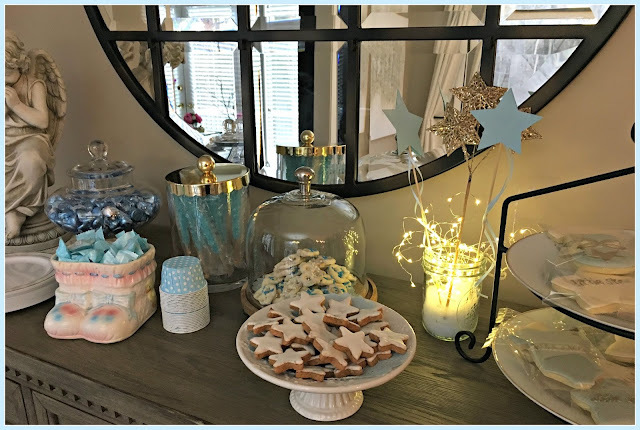 I set up a candy and cookie bar. The little ceramic bootie planter with the It's a Boy! 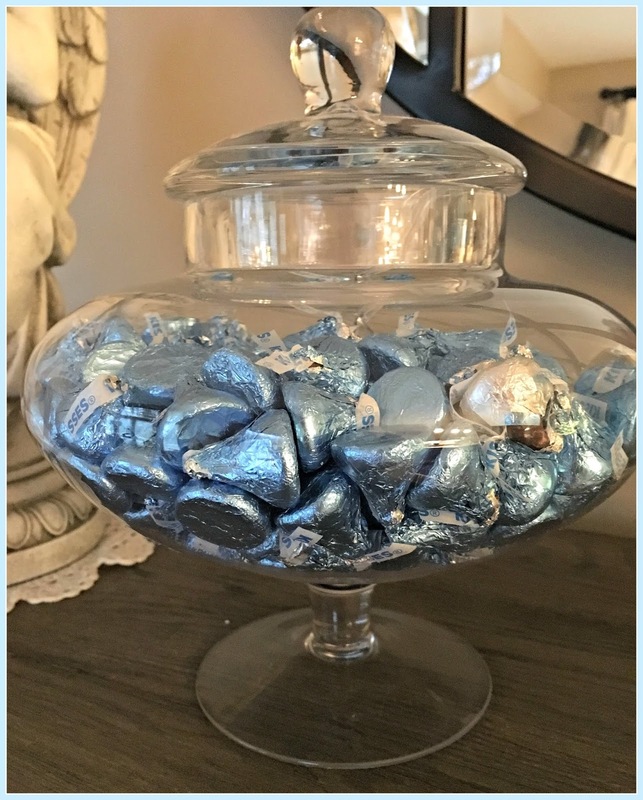 mints was once filled with a floral arrangement that I received after my daughter was born. It adds a sentimental touch. 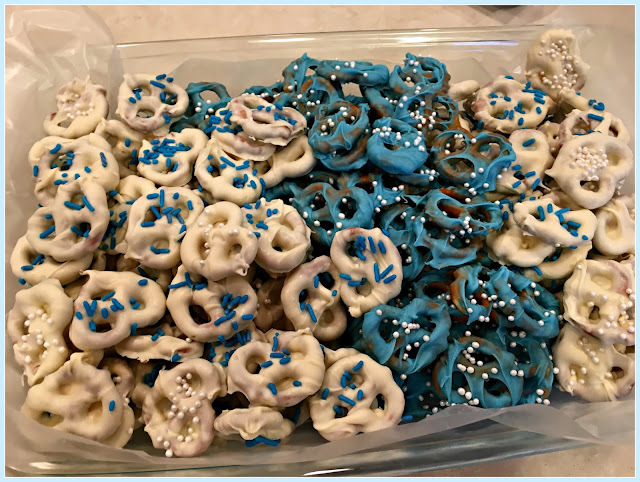 The only thing I made were these chocolate-covered pretzels. 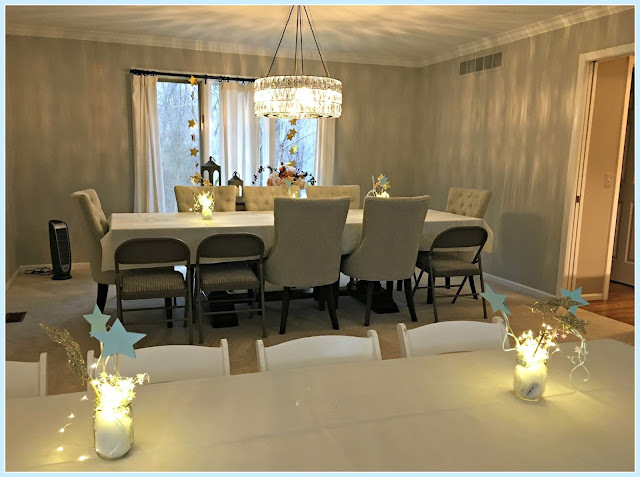 It was so fun to just work on the decorating and not worry about preparing food for 35 people. When I was planning the shower, I googled blue candy, and found lots of fun and festive options. I had to rein myself in after I started filling my online shopping cart with blue lollipops, blue gummy bears, blue twizzlers, and more! 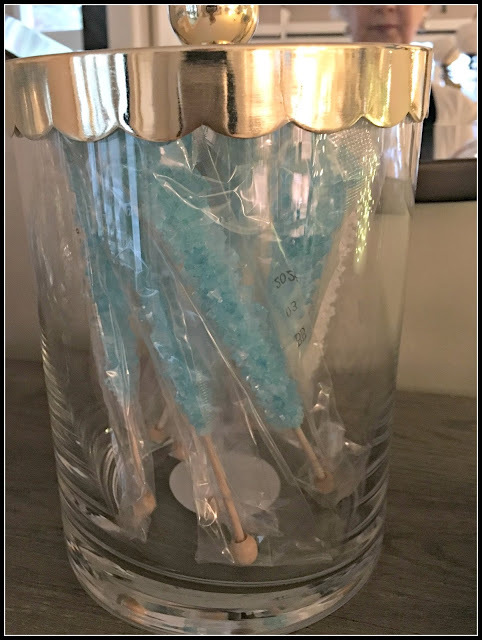 I couldn't resist these blue and white sugar swizzle sticks. 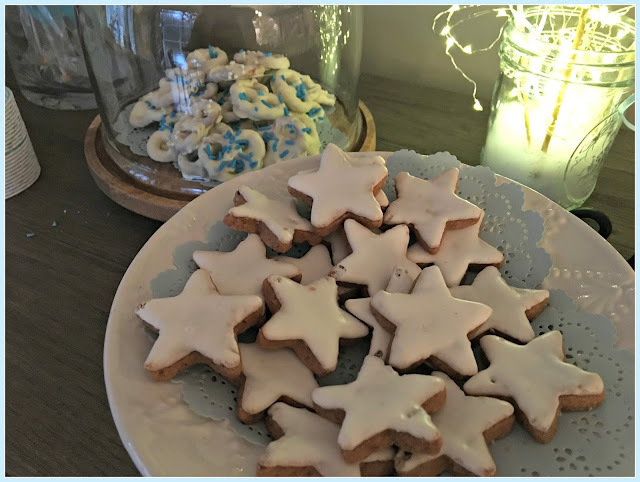 These little star cookies, found at our local grocery store, fit in perfectly with the Twinkle, Twinkle Little Star theme. I love these cookies! 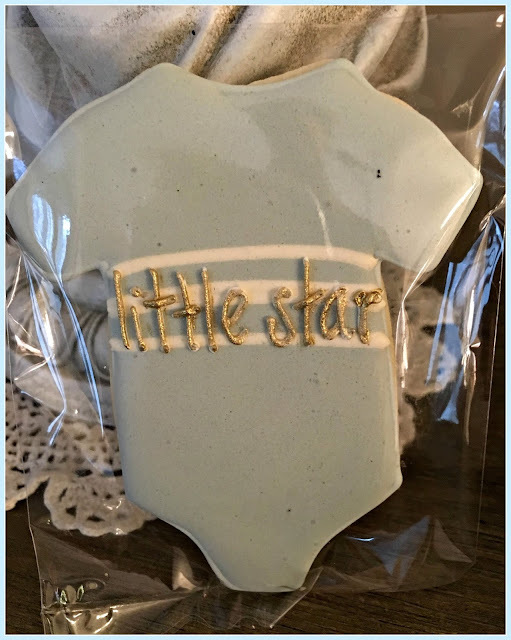 I saw some like this on etsy and knew they would be perfect for the shower. I asked at our local bakery if they could make something similar and I was thrilled at what a beautiful job they did. 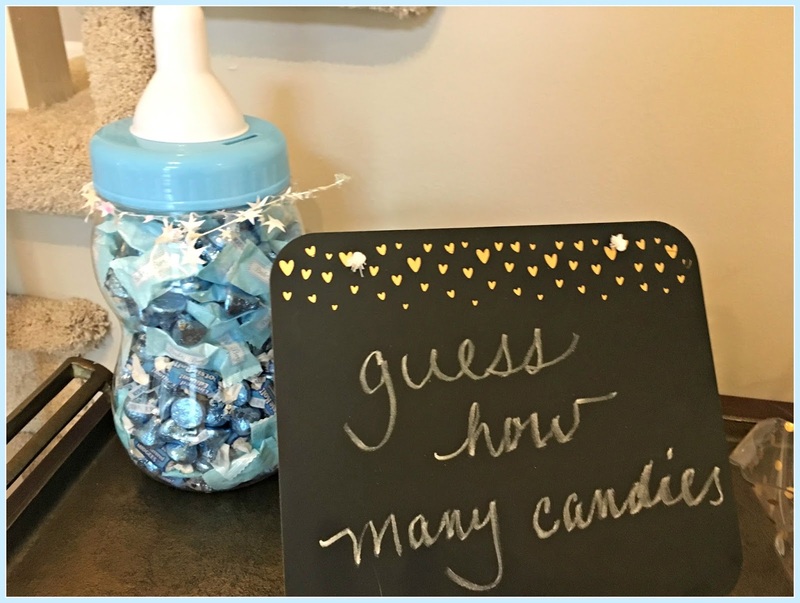 When people arrived they were greeted by this sign and asked to guess how many candies in the baby bottle. A friend of my daughter's brought little cans of play-doh for everyone and we had a contest to see who could make the cutest baby! So much fun. 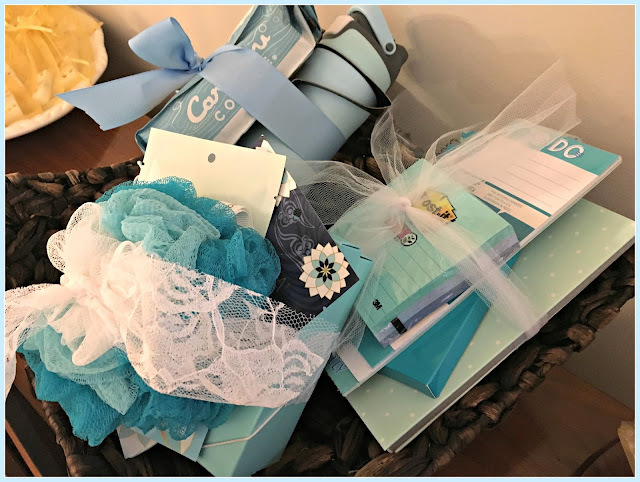 Here are a few of the prizes -- an insulated coffee mug with coffee, a bath and body pampering gift, and a package containing pencils, notebook, sticky notes, etc., all in blue of course. The little guy is going to be so cute in all the little outfits he received. Here is my daughter with her dear friend who flew up from Alabama for the weekend. 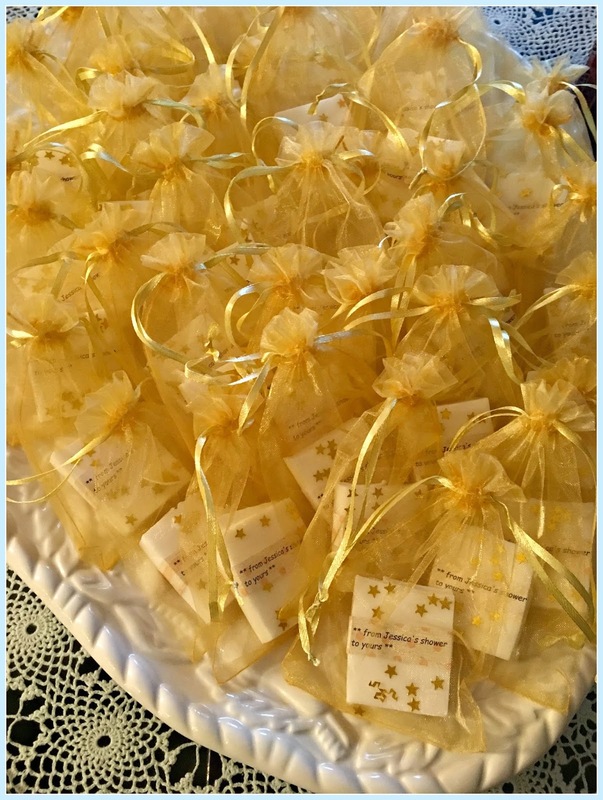 Each guest went home with a little soap labelled "**from Jessica's shower to yours**." I purchased these organic coconut oil soaps from etsy and then dipped them in gold stars and put them in little gold organza drawstring bags. And then the next day, Sunday, we celebrated at another shower hosted by Jessica's mother-in-law. What a special weekend. We are so thankful and looking forward to welcoming this little one. He is already so loved. 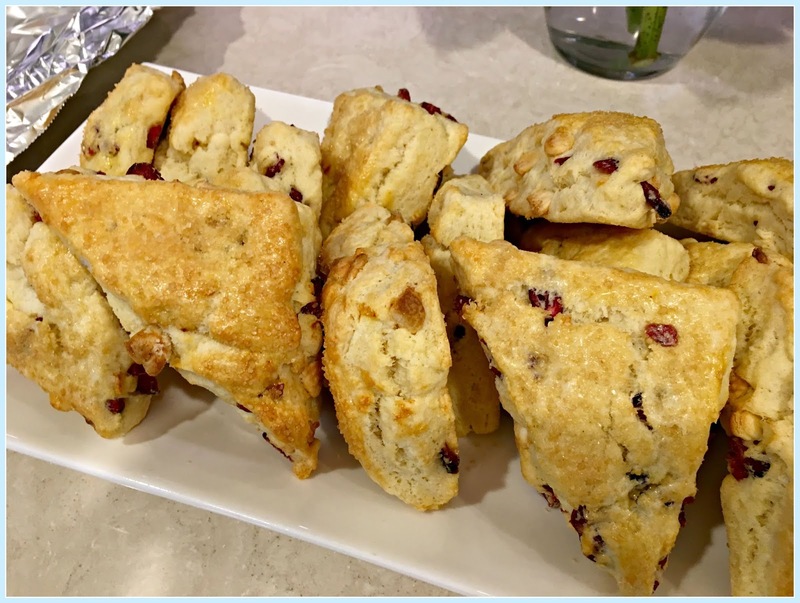 How very wonderful that you had the shower catered, Deborah!! Yes, you could enjoy every minute of it then. Everything looked just so special and the decorations were perfect. You and your daughter looked so beautiful, too. How special that her friend came up from Alabama. 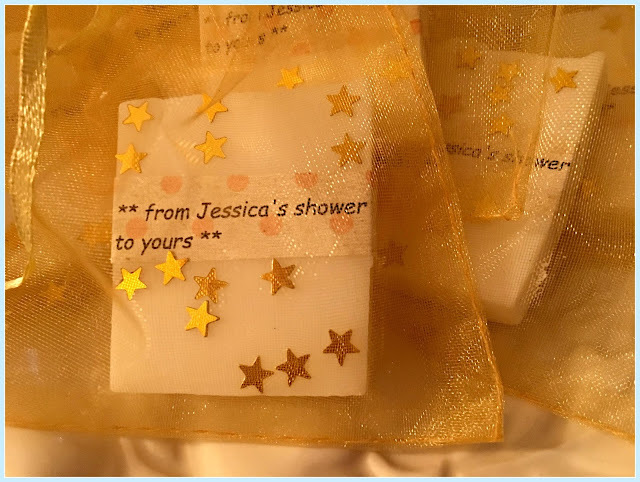 I know Jessica appreciated all that went into making her shower so special. It's going to be so exciting when the little one arrives. Awe, I'm so happy for you, Deborah! Christmas is on the way and after that a new little grandbaby to love on! What a treat going into 2019! Your baby shower sounded fabulous and you were smart to get it catered. I will never do something like that on my own again. I hosted my son's wedding party at the church and I paid dearly for it. I remember I was exhausted and hardly enjoyed the occasion because of it. We need to relax and enjoy the festivities too. I loved all your ideas. Your daughter must have been thrilled! Merry Christmas, my friend! What a wonderful celebration! There's so much to look forward to. The shower sounds just lovely and it was so smart of you to have it catered. I was just thinking about you today and wondering how you are! And here you are telling us this wonderful news. Everything looked so special and inviting. Such lovely decorating ideas. You and your daughter share the same beautiful smile. Everything was just to perfection and sooooo cute! He is already a most celebrated little fella. Love all the decor, just beautiful. Grans are GRAND! You are in for a whole lot of fun. Hugs! What a wonderful celebration. Every part of it the food, the table decor looked amazing. What a great welcome for this much loved baby boy. What a Beautiful shower, Deborah, and I love all the food! What a lovely party! Your decorations are, literally, dreamy! I love this! Everything looks so beautiful. God bless!! 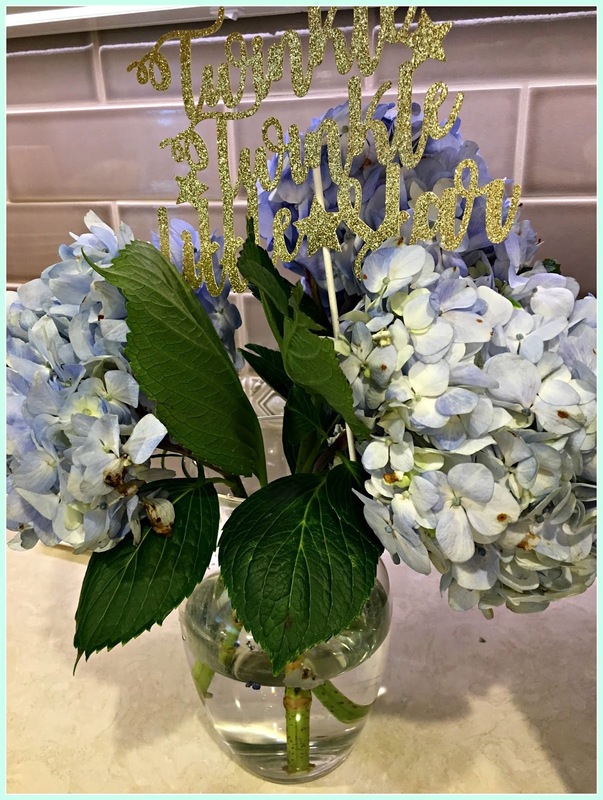 A beautiful shower for your beautiful daughter! 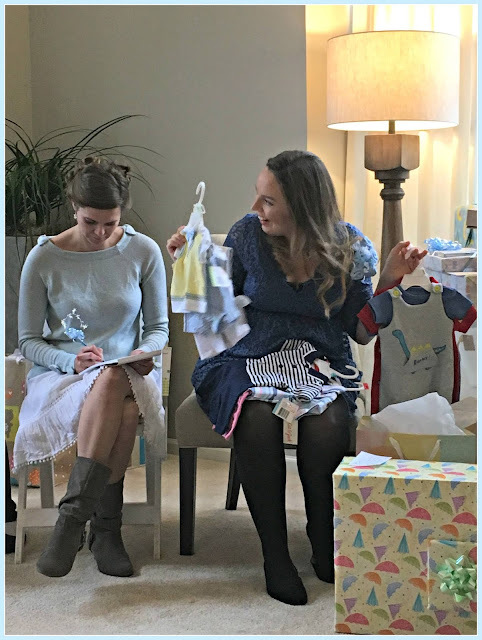 Exciting times as you wait for this first grandbaby... The photo of you and your daughter is wonderful. Awww, Deborah, what a loving gesture. 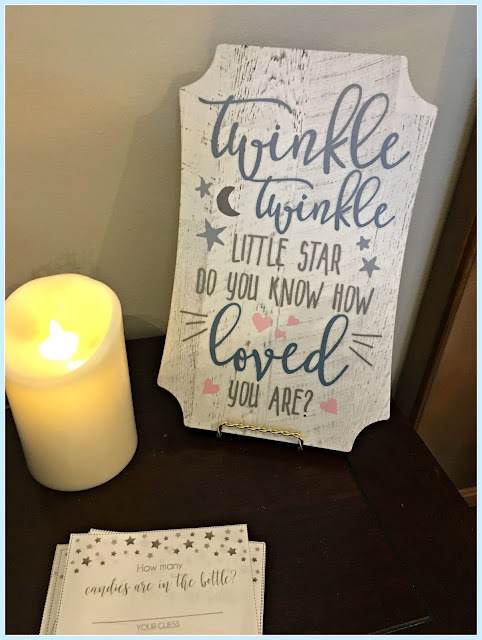 Your decor looked so sweet for the baby star to come. You & your daughter both look amazingly beautiful. I love the idea of catering. I am having a bit of anxiety this year in that my family number for Christmas Eve dinner has grown to 38 overnight! Your array of food and having your needs in the kitchen met make me want to do the same, but who would work on Christmas Eve? I must look into it. Wow! What a stellar baby shower! 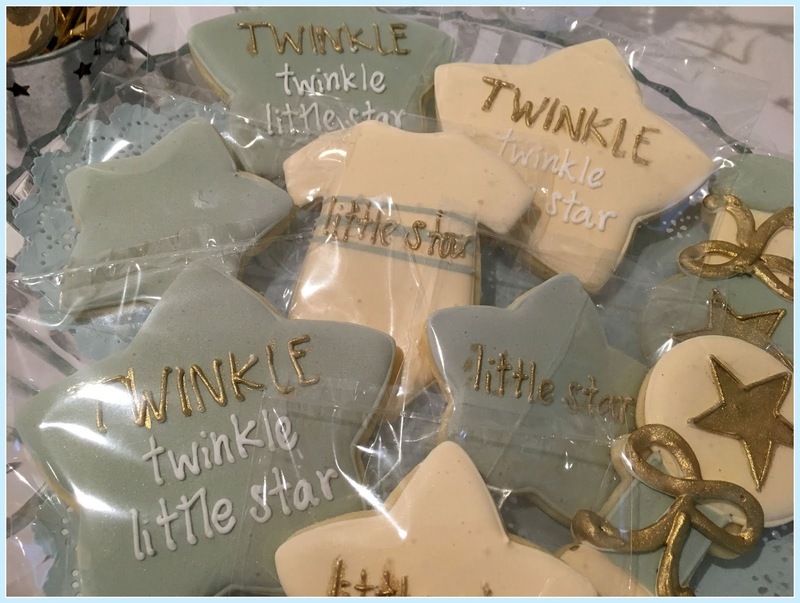 Am I too old to have my own "Twinkle, Twinkle"-themed party (minus the blue and baby stuff)? HA! Congratulations, Deborah! What a lovely, sparkly baby shower. You did a wonderful job! Love the pic of you and your daughter. Oh how fun! Deborah, you did a fabulous job getting your girl's shower all together! She is adorable and I can see that you share the same smile. :) Such a darling theme and everything looks beautiful...and the food looks delicious! 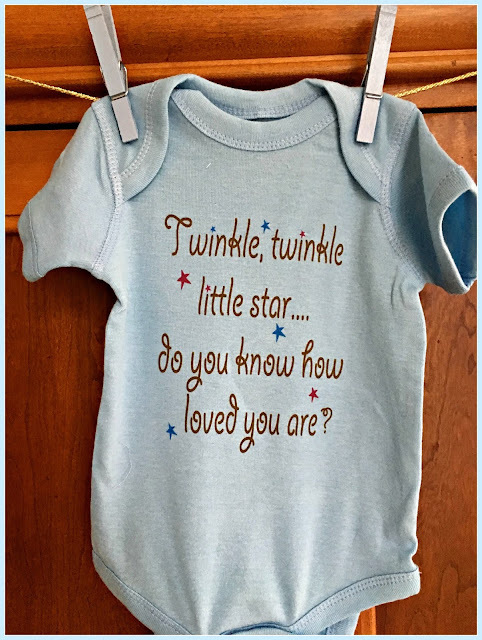 I know you must be bursting at the seams with excitement to meet your sweet grandson. Looks like it won't be much longer! HUGS! 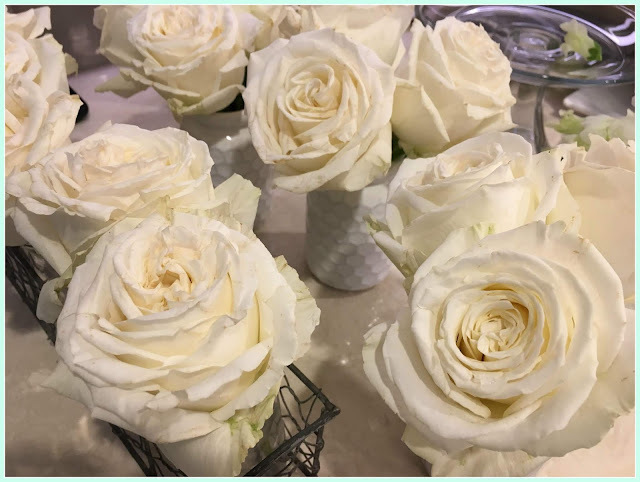 That was a wonderful and special time together with your daughter and you choose right for having the event catered so you too could enjoy it! Guess the colder weather makes such a cozy shower so much sweeter, warmly tucked away inside the comfort of home. Can't believe how fast the time is going... Too much to do for the remainder of this year! 316!!?? Wow - I'd never have guessed so many! What a beautiful shower. 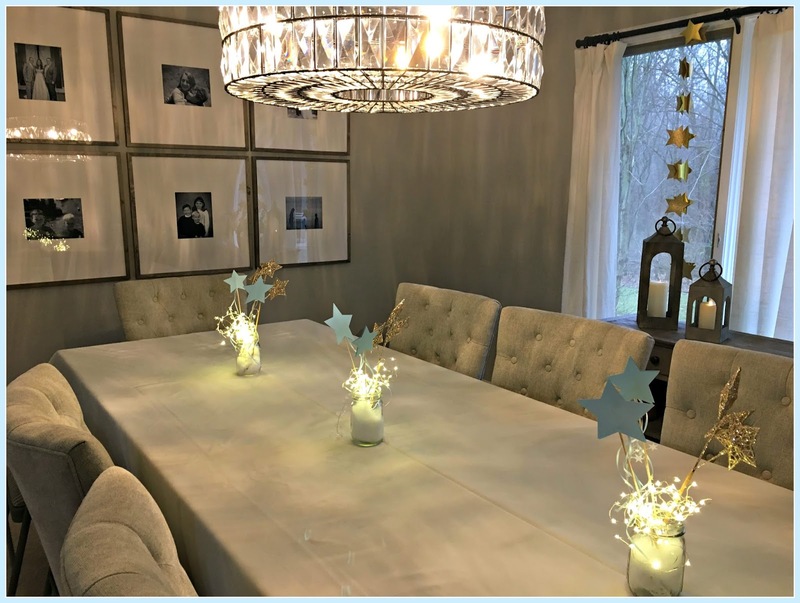 Your dining room looks very magical - that light and the shadows :) And the centerpieces look like they are fire crackers going off! She must've been so very happy. 35 guests is a LOT, so I'm glad you had it catered. Just gorgeous, and many congratulations to you and your family on the welcoming of this little one! Oh my goodness!! 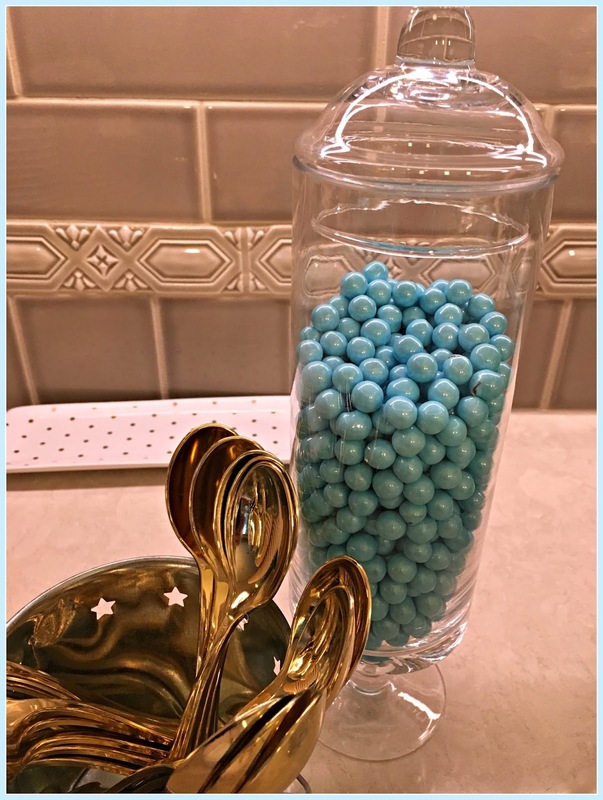 Love the theme of this shower and that mason jar DIY is just so cute. At one of the San Francisco venues I also threw a basket ball themed baby shower for my best friend. She is expecting a baby boy and I was totally excited to plan and plot this bash that went super successful.